Kyocera Corporation (NYSE:KYO)(TOKYO:6971) today announced that it has developed an ultra-small ceramic package utilizing a proprietary multilayer structure with a built-in RFID*1 antenna that can increase the read range up to 2X as compared with conventional packages of the same size. Starting mass production in May 2017, the product will be available worldwide in three sizes (from 6x3x1.7mm to 15x5x1.7mm), with an annual sales target of JPY 3 billion by 2020. Kyocera’s proprietary technologies cultivated over many years in advanced ceramic materials and multilayer structures ensure a compact package with outstanding performance. The new ceramic package with a RFID antenna will help meet rising demand for RFID tags to support Internet of Things (IoT) applications. As production of IoT devices continues to expand, RFID technology is expected to proliferate into the automotive and medical industries, factory automation and many other industrial fields — with a market expected to total JPY 100 billion (approx. USD 900 million) by 2020*2. While packages utilizing organic or resin-based materials will be utilized for conventional RFID tags in common retail applications, many other applications will require durable RFID packages with higher resistance to harsh environments such as water, heat and chemicals, while still delivering greater read ranges. 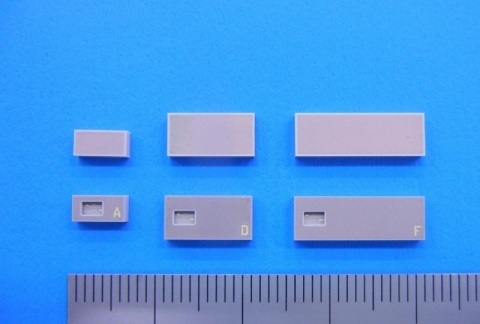 In UHF band*3 testing, this new ceramic package with an embedded RFID antenna provided a read range between 1.5 and 2 times that of conventional RFID tags of the same size. Even as package size decreased, the Kyocera low-profile thin multilayer cavity structure continued to outperform the conventional RFID tags of similar outlines. These RFID packages are an excellent example of Kyocera’s extensive multilayer ceramic capability, using a proprietary Low Temperature Co-fired Ceramic (LTCC) formulation and a copper conductor metallization system. The packages take advantage of the low-loss and high-frequency benefits of LTCC, yet deliver the high flexural strength expected from High Temperature Co-fired Ceramic (HTCC). With a cavity designed specifically for an IC chip, this package offers excellent protection against mechanical stress and impact, while facilitating ultra-small, low-profile tag design. In contrast to traditional tags that tend to block RF signals, Kyocera’s ceramic package is designed to maximize read range in proximity to metal. This expands RFID feasibility in applications involving metallic products or objects, opening new potential uses in automotive, factory automation, healthcare and many other fields. Kyocera offers many options to meet diverse customer requirements. The packages are available in six base configurations — three different sizes for both the UHF and HF*4 (for ultra-short-distance communication) bands. To meet diverse customer demands, Kyocera offers built-in IC chip arrangement and device assembly, providing RFID tags as finished products, in addition to providing ceramic packages and customized designs upon request. Kyocera Corporation (NYSE:KYO)(TOKYO:6971) (http://global.kyocera.com/), the parent and global headquarters of the Kyocera Group, was founded in 1959 as a producer of fine ceramics (also known as “advanced ceramics”). By combining these engineered materials with metals and integrating them with other technologies, Kyocera has become a leading supplier of electronic components, semiconductor packages, industrial ceramics, printers, copiers, solar power generating systems, mobile phones and cutting tools. During the year ended March 31, 2017, the company’s net sales totaled 1.42 trillion yen (approx. USD12.7 billion). Kyocera appears on the 2014 and 2015 listings of the “Top 100 Global Innovators” by Thomson Reuters, and is ranked #531 on Forbes magazine’s 2016 “Global 2000” listing of the world’s largest publicly traded companies.